HandPunch technology (HandPunch Readers) from Schlage biometrics authenticates users by identifying their hand geometry and comparing it against saved templates. 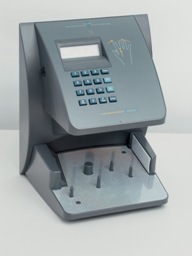 HandPunch readers provide fast, precise and hygienic time and attendance access. Hand scanning biometric data capture technology eliminates the need for employee badges as well as prevents buddy punching. Plus, integrate our HandPunch terminals with your existing software system, or adopt one of our software solutions (like XactTime or one of our desktop software products).